Ten Years After are an English blues rock band, most popular in the late 1960s and early 1970s. Between 1968 and 1973, Ten Years After scored eight Top 40 albums on the UK Albums Chart. In addition they had twelve albums enter the US Billboard 200, and are best known for tracks such as "I'm Going Home", "Hear Me Calling", "I'd Love to Change the World" and "Love Like a Man". Their musical style consisted of blues rock, and hard rock. The band's core formed in late 1960 as Ivan Jay and the Jaycats. After several years of local success in the Nottingham/Mansfield area, known since 1962 as the Jaybirds and later as Ivan Jay and the Jaymen, Alvin Lee and Leo Lyons founded Ten Years After. Ivan Jay (born Ivan Joseph Harrison, 1939, Nottingham, Nottinghamshire, died in April 2009, USA) sang lead vocals from late 1960 to 1962 and was joined by Ric Lee in August 1965, replacing drummer Dave Quickmire (born David Quickmire, 1940, Mansfield, Nottinghamshire), who had replaced Pete Evans (born Peter Evans, 1940, Mansfield, Nottinghamshire) in 1962. Ray Cooper (born 11 November 1943, Huthwaite, Nottinghamshire) played rhythm guitar, vocals from 1960 to 1962. In 1966, The Jaybirds moved to London to back The Ivy League. In the same year, Chick Churchill joined the group as keyboard player. That November, the quartet signed a manager, Chris Wright, and changed their name to Blues Trip. Using the name Blues Yard they played one show at the Marquee Club supporting the Bonzo Dog Doo-Dah Band. They again changed their name, to Ten Years After – in honour of Elvis Presley, an idol of Lee's. (This was ten years after Presley's successful year, 1956). Some sources[which?] claim that the name was pulled by Leo Lyons from a magazine, advertising a book, Ten Years After The Suez (referring to the Suez Crisis). In 1968, after touring Scandinavia and the United States, Ten Years After released a second album, the live Undead, with the noteworthy song, "I'm Going Home". They followed this in February 1969 by the studio issue Stonedhenge, a British hit that included another well-known track, "Hear Me Calling" (it was released also as a single, and covered in 1972 by the British glam rock rising stars, Slade). In July 1969, the group appeared at the Newport Jazz Festival, in the first event rock bands were invited to. Between 26–27 July 1969, they appeared at the Seattle Pop Festival held at Gold Creek Park. On 17 August, the band performed a breakthrough American appearance at Woodstock; their rendition of "I'm Going Home" featuring Alvin Lee as lead singer, was featured in both the subsequent film and soundtrack album and catapulted them to star status. In 1970, Ten Years After released "Love Like a Man", the group's only hit in the UK Singles Chart, where it peaked at #10. It was the first record issued with a different playing speed on each side: a three-minute edit at 45rpm, and a nearly eight-minute live version at 33rpm. This song was on the band's fifth album, Cricklewood Green. In August 1970, Ten Years After played the Strawberry Fields Festival near Toronto, and the Isle of Wight Festival 1970. In 1971, the band switched labels to Columbia Records and released the hit album A Space in Time, which marked a move toward more commercial material. It featured the group's biggest hit, "I'd Love to Change the World". In late 1972, the group issued their second Columbia album Rock & Roll Music to the World and, in 1973, the live double album Ten Years After Recorded Live. The band subsequently broke up after their final 1974 Columbia album, Positive Vibrations. The members reunited in 1983 to play the Reading Festival, and this performance was later released on CD as The Friday Rock Show Sessions – Live at Reading '83' . In 1988, the members reunited for a few concerts and recorded the album About Time (1989) with producer Terry Manning in Memphis. In 1994, they participated in the Eurowoodstock festival in Budapest. Ric Lee is also currently in a band called Ric Lee's Natural Born Swingers, along with Bob Hall. In January 2014, it was announced that both Gooch and Lyons had left Ten Years After. Two months later, veteran bass player Colin Hodgkinson and singer/guitarist Marcus Bonfanti were announced as their replacements. The New Musical Express Book of Rock, Star Books, 1975. ISBN 0-352-30074-4. Paytress, Mark (January 1997). "Ten Years After". Record Collector. No. 221. pp. 84–89. ^ a b Roberts, David (2006). British Hit Singles & Albums (19th ed.). London: Guinness World Records Limited. p. 553. ISBN 1-904994-10-5. ^ "Ten Years After | Awards". AllMusic. Retrieved 29 January 2014. ^ Nielsen Business Media, Inc. (19 January 2002). Billboard. Nielsen Business Media, Inc. p. 24. ISSN 0006-2510. ^ David Dicaire (19 December 2001). More Blues Singers: Biographies of 50 Artists from the Later 20th Century. McFarland. p. 59. ISBN 978-0-7864-1035-4. ^ Robert Santelli (2001). The Big Book of Blues: A Biographical Encyclopedia. Penguin Books. p. 455. ISBN 978-0-14-100145-6. ^ James E. Perone (2012). The Album: A Guide to Pop Music's Most Provocative, Influential, and Important Creations. ABC-CLIO. p. 262. ISBN 978-0-313-37906-2. ^ Prown, Pete (1997). Legends of Rock Guitar: The Essential Reference of Rock's Greatest Guitarists. Hal Leonard Corporation. p. 73. ISBN 978-0793540426. ^ Chappell, Jon (2006). Blues Guitar For Dummies. John Wiley & Sons. p. 241. ISBN 978-0470049204. ^ a b "Alvin Lee biography". Alvinlee.com. Retrieved 25 October 2013. ^ a b "Alvin Lee, British Blues-Rock Guitarist, Dies at 68". The New York Times. Retrieved 16 February 2016. ^ a b c Roberts, David (1998). Guinness Rockopedia (1st ed.). London: Guinness Publishing Ltd. p. 444. ISBN 0-85112-072-5. ^ a b c d e f g h i j William Ruhlmann. 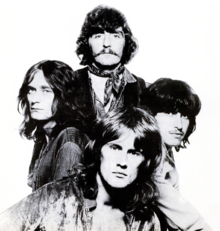 "Ten Years After | Biography". AllMusic. Retrieved 29 January 2014. ^ Roberts, David (1998). Guinness Rockopedia (1st ed.). London: Guinness Publishing Ltd. p. 205. ISBN 0-85112-072-5. ^ Roberts, David (1998). Guinness Rockopedia (1st ed.). London: Guinness Publishing Ltd. p. 355. ISBN 0-85112-072-5. ^ Rob Power. "Ten Years After's Alvin Lee dies". MusicRadar. Retrieved 15 June 2013. ^ "Ten Years After Singer And Guitarist Alvin Lee Dies Aged 68". Stereoboard.Com. 6 March 2013. Retrieved 15 June 2013. ^ "MusikWoche | News | Alvin Lee von Ten Years After verstorben". Mediabiz.de. Retrieved 15 June 2013. ^ "Ten Years After lose frontman and bassist". Classic Rock Magazine. 13 January 2014. ^ "Ten Years After reveal new line-up". Classic Rock Magazine. 21 March 2014.